This space is for keeping track of my fabric creations. September 2016 I made the big t-shirt quilt, but photographing a big quilt remains far down on my list of things to do. I've worked with lots of great sewing students! 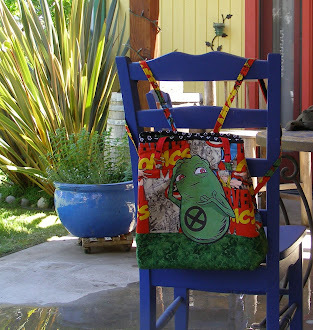 June 2015 A friend and I are starting a sewing school in Santa Maria for 5 to 10 children. I'm still doing my individual lessons at Beverly's. Coming soon: A big Tshirt quilt, and a record album bag. December 2014 I love making presents. 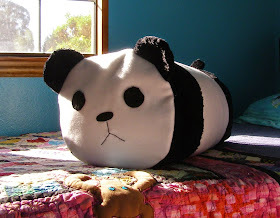 3 pillows so far: a panda roll, a slice of sushi, and a plaid house. 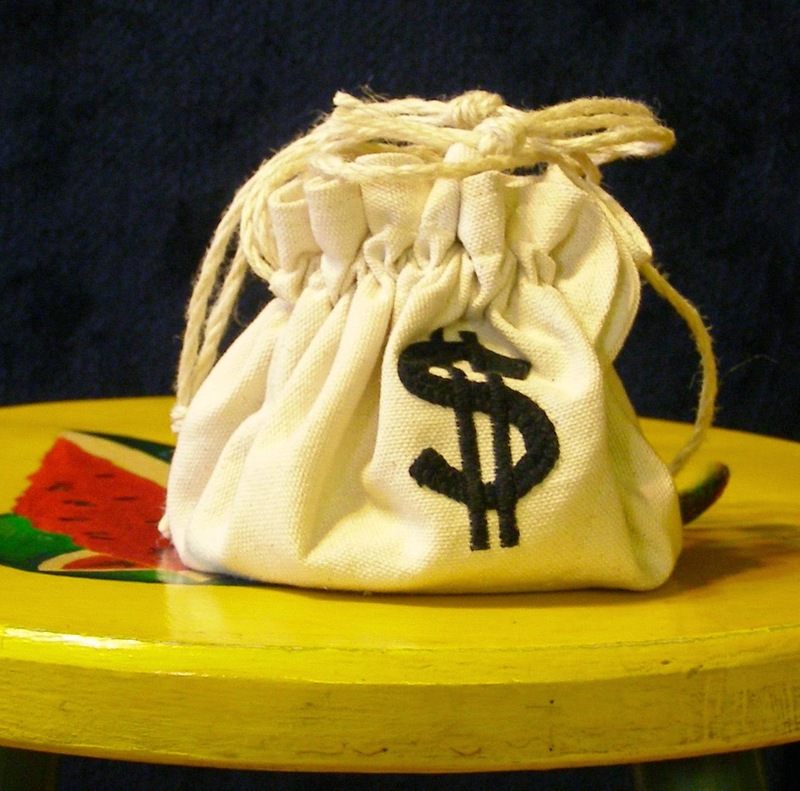 Coming up: tidy bags for the car (including one made with Star Wars Storm Trooper fabric for my Darth Vader Mazda), drawstring money bag (to be filled with many quarters), storage totes, Periodic Table of the Elements pillow case, and a shiny red steering wheel cover. 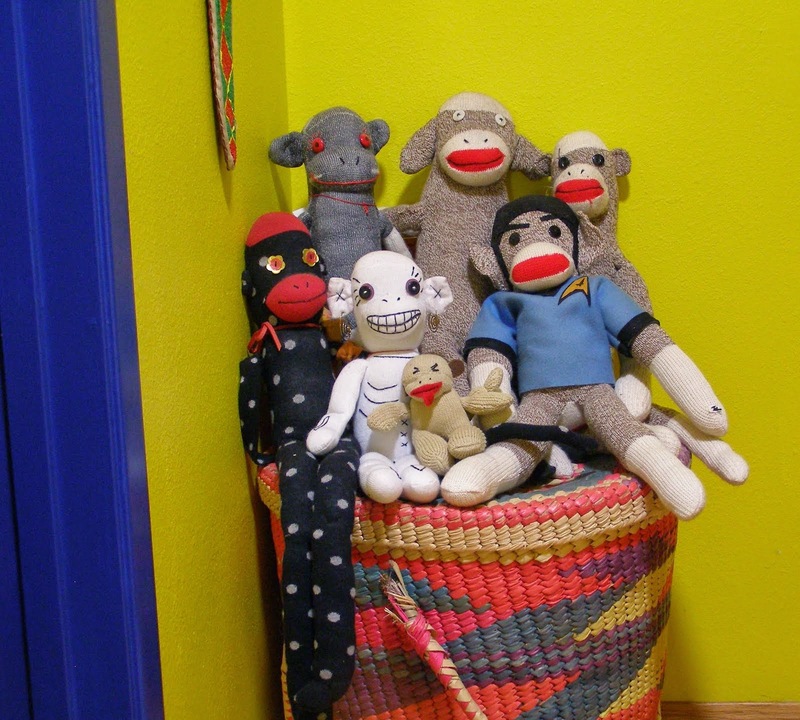 July 2014 Can you believe that no one in town wants to make a sock monkey!? 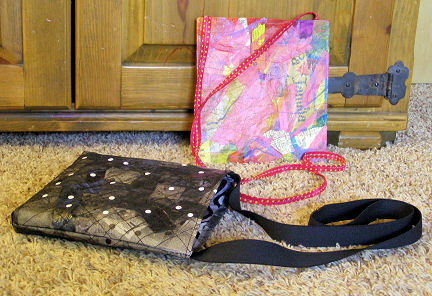 Well, sewing is all about what you want to make, so my classes have become individualized tutorials. 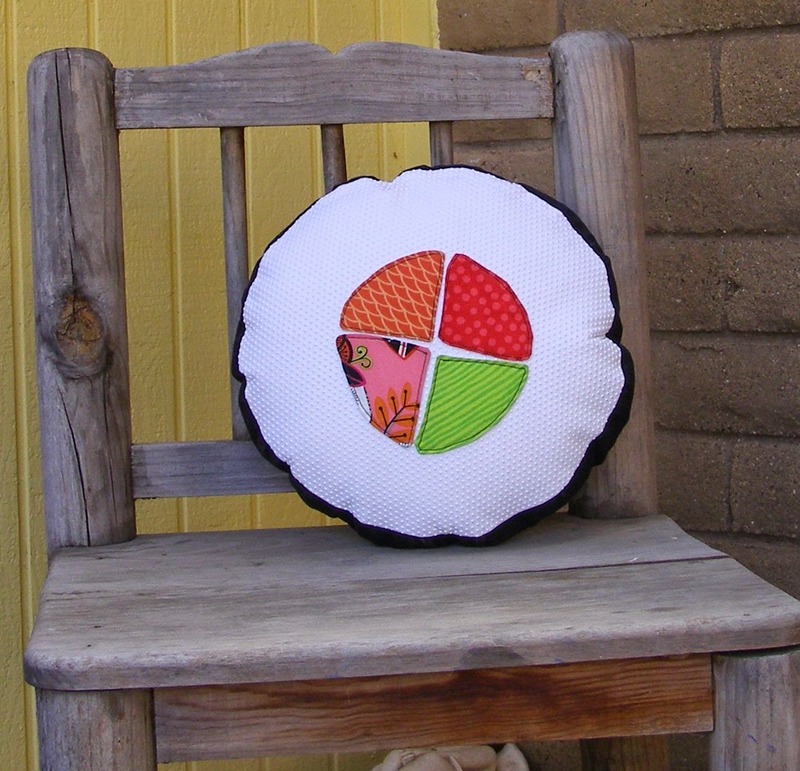 I've helped students make fabric bowls, aprons, doll clothes, drawstring bags. I help navigate any tricky parts and explain what skills are needed and what skills can be acquired. So; what do you want to make? 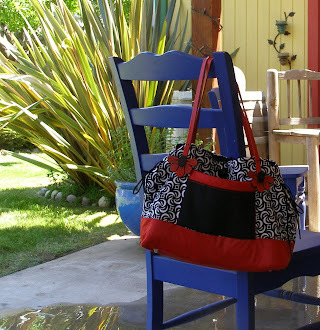 2013 I am now teaching sewing classes at Beverly's in Santa Maria! So far, the most popular has been Machine Basics, where I've helped a few folks get their machines up and sewing. 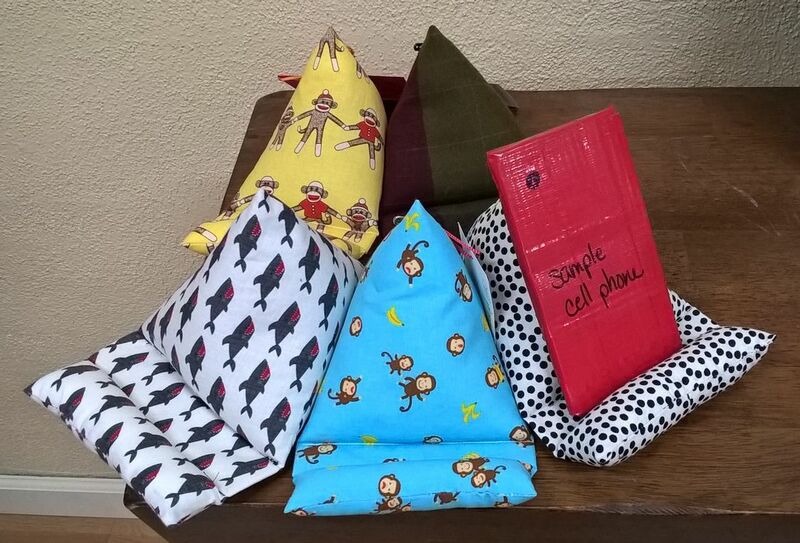 Other classes I offer are Sock Monkey!, Soft Blocks, and Mini Quilts. And tote bags. Note to self: get some pictures up! From the bucket list. I mean to say that I've wanted to make one of these for a long time now. Luckily, a great teacher, Diana Coronado, taught a tuffet class at Beverly's. She had the supplies, too. I changed the pattern a bit, going from 64 wedges to 16. It's no coincidence that it matches my yellow wall. 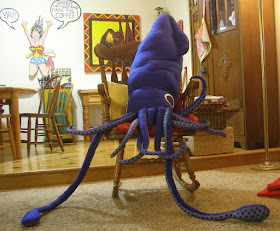 I love my 8-foot Giant Squid! In the background you can see the studio space I share with my husband, John Garcia. Those are his paintings on the wall. Check out his work on Life with Wonder Woman.wordpress.com. 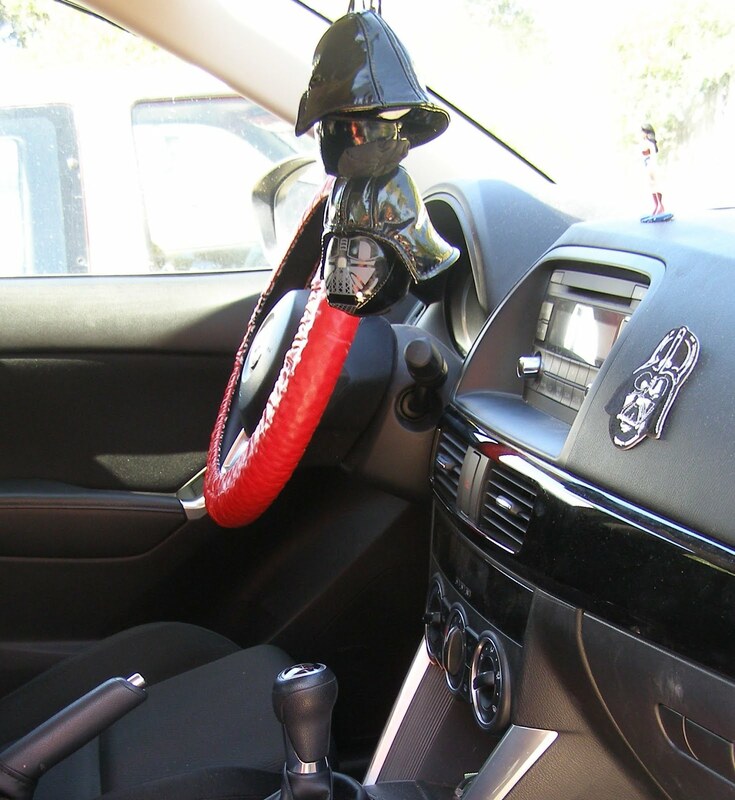 I cut the Darth Vader heads off of a pair of slippers to make the coolest rear-view mirror dangles ever. 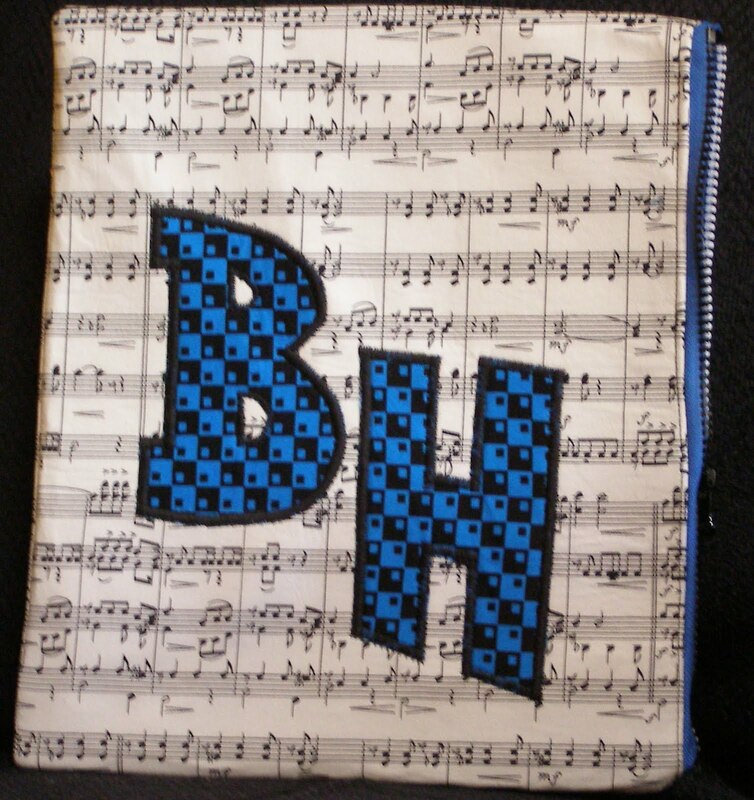 Great gift for a great music teacher. 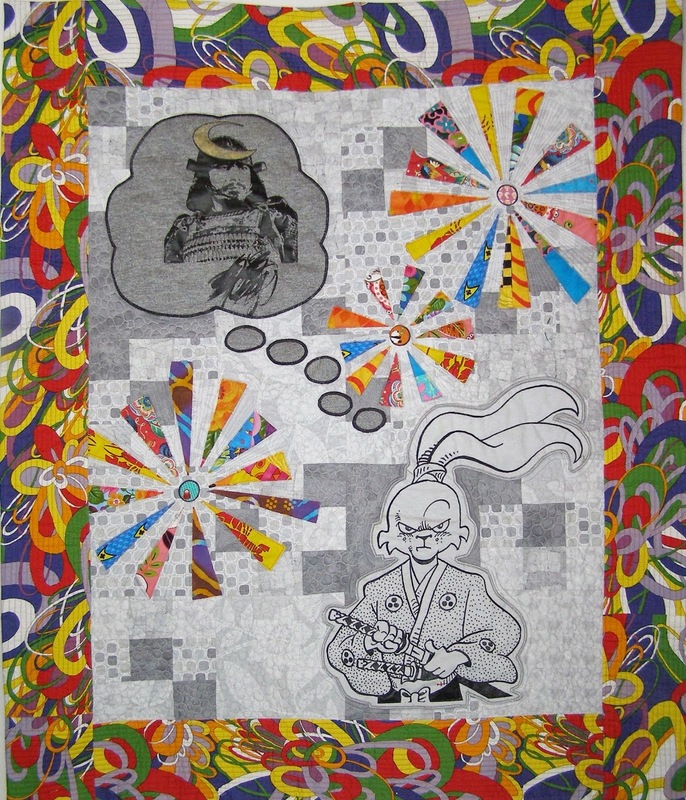 I sent a pic of this quilt to Stan Sakai, hoping he would want to display in his booth at a comic convention. I'm still hoping! My valentine for my husband. 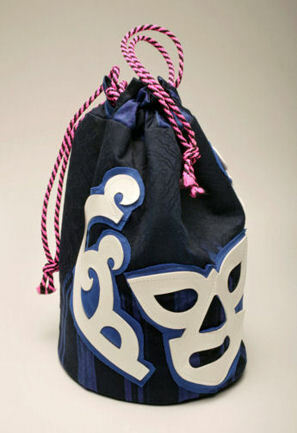 Filled with quarters, this made a great gift for a teenaged boy. Jiffy grip makes great rice! I made this from a pattern in Stitch magazine. It holds its shape well because of heavy interfacing. Nevertheless, it's soft and comfy. And it's fun to see a chunky house on a sofa. 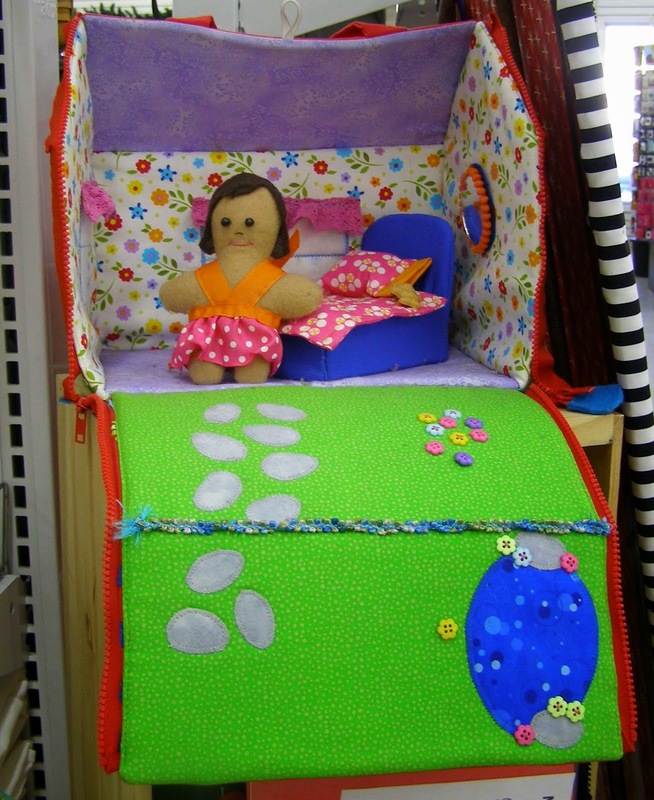 Wildly fun to make, yet a lot of work, this house sports a bed with pillow and blanket, a button teddy bear and a mirror on the wall! It's on display at Beverly's Santa Maria. Note the rick rack roof and button door knob! 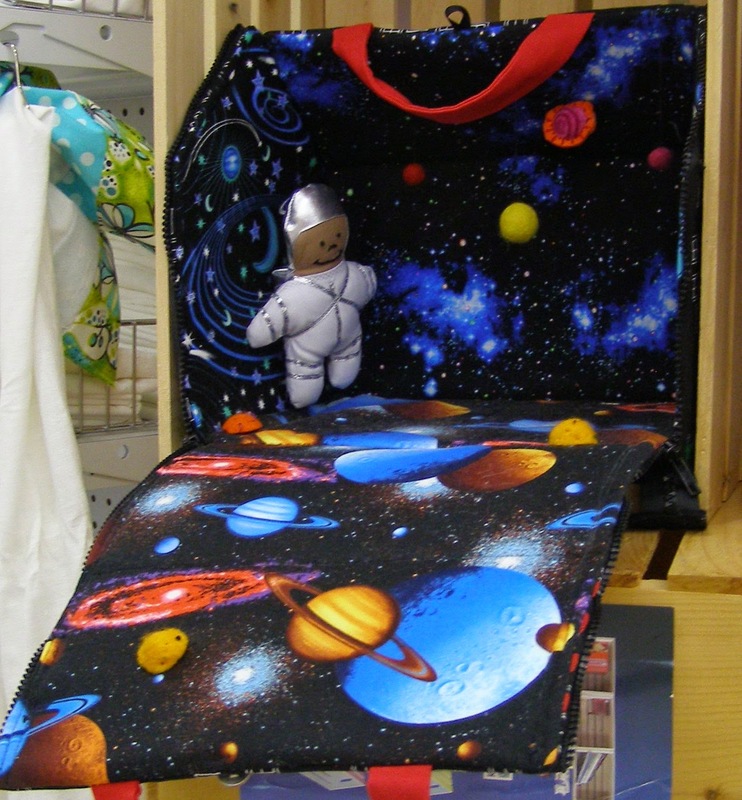 I use the same pattern for this space themed house as I did for the doll house. I downloaded the Nasa logo and printed it on fabric. That's a StarTrek communicator on the door--I bought that at Comic-Con a few years back. There are four hanging planets--great use of wool-felt beads! The bus image came from a child's embroidered tshirt. 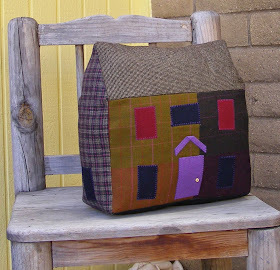 The houses are fanciful fabric combinations sewn pancake-pillow style. 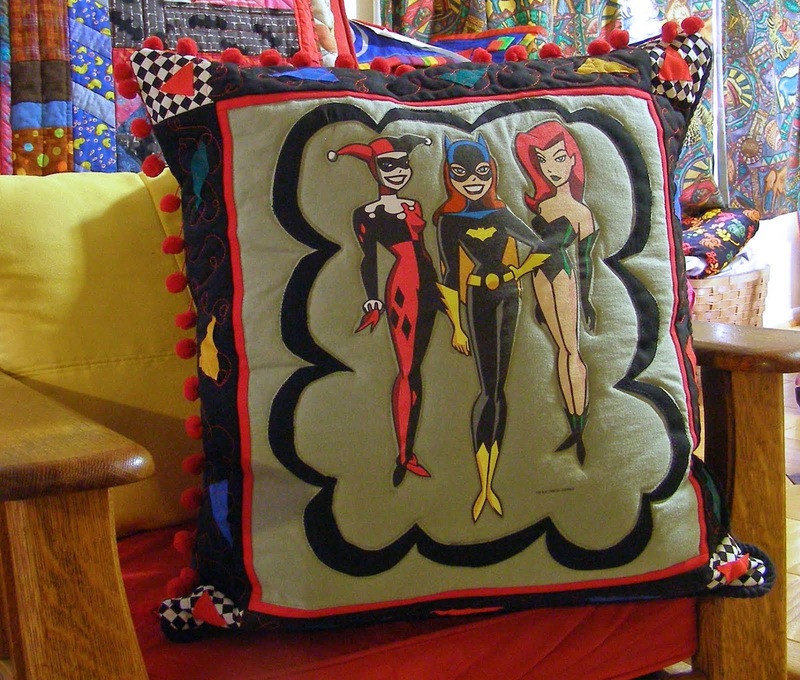 Harley Quinn, BatGirl, Poison Ivy look better on a pillow than on me. All You Need 22" x 14"
I used the paper-cloth technique to make the letters. Paper-cloth is essentially decoupaging paper to fabric, resulting in crisp cuts that are still sewable. 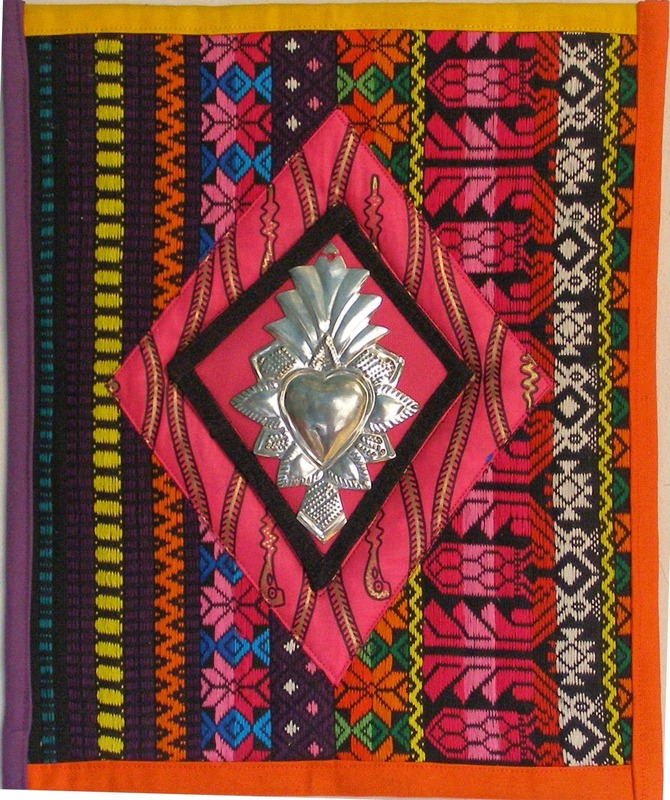 26 x 20", cotton, synthetic, polymer clay, sequins. 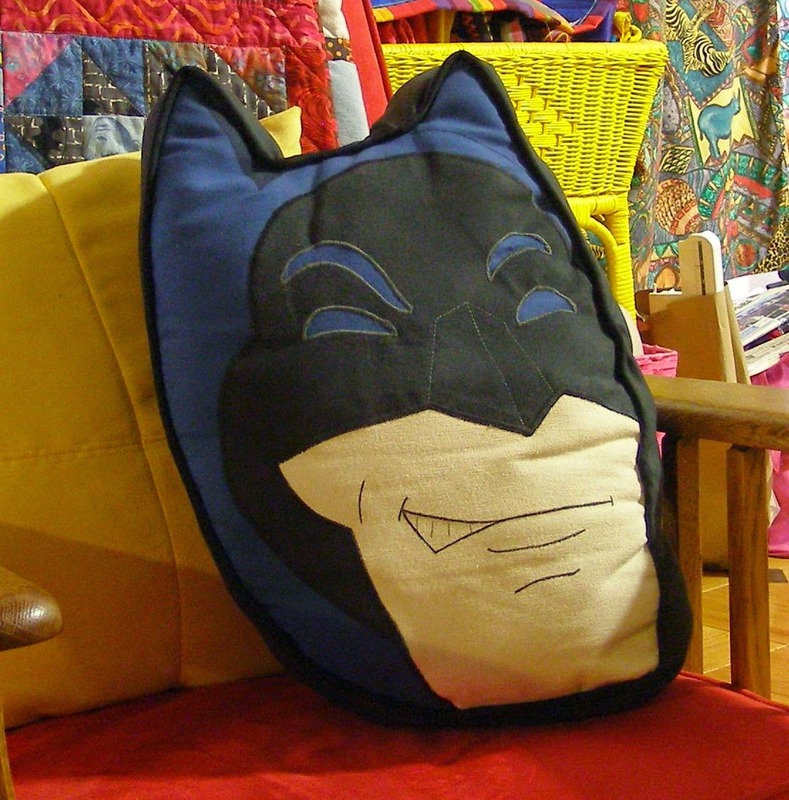 This is different for me, except for the bit of Elvis fabric. 11 x 14" Hand-dyed wool felt and cotton batting, polymer clay. I bet I'll be the only one at Comic-Con with a Doop backpack! Doop is the alien videographer who hangs out with Wolverine. 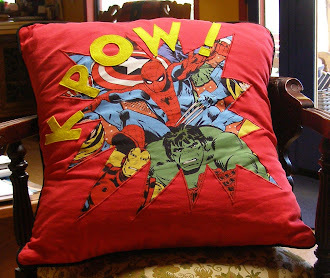 Here's an example of a project that started with the fabric, the Marvel superheroes crowded together ready for action. 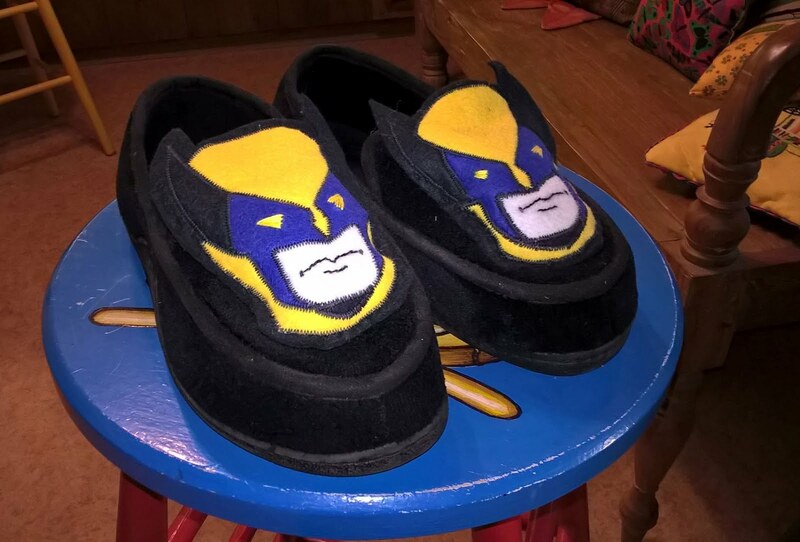 Of course they had to burst out of something. The letters are wool felt. 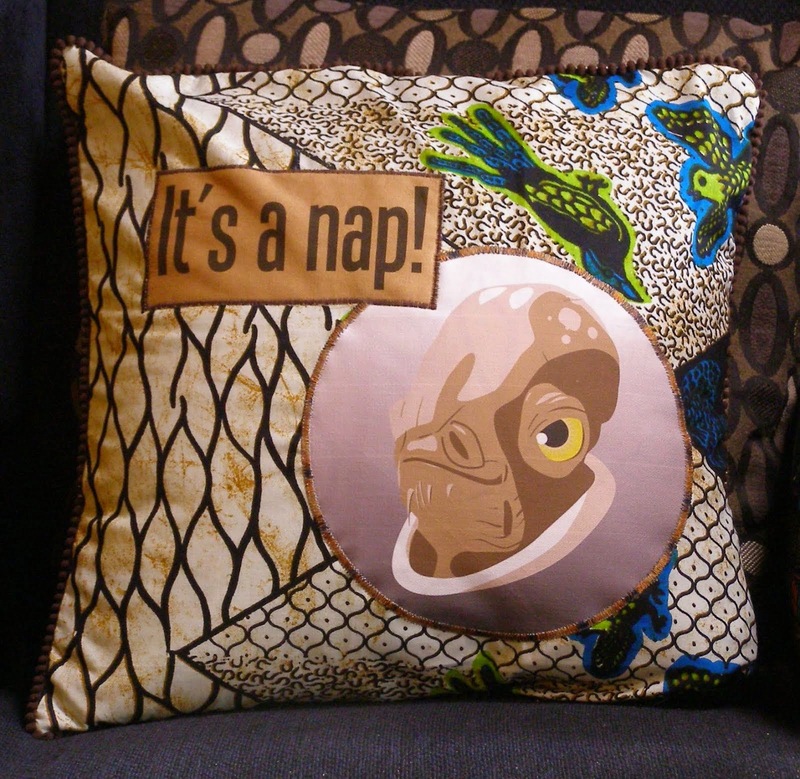 This pillow completely works with the decor in my home. 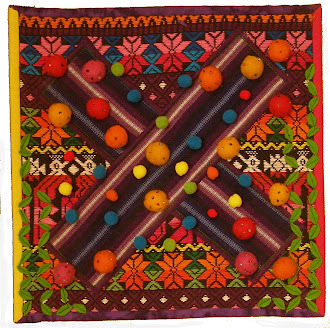 This small quilt has 2 Guatemalan fabrics, wool felt, and wool beads. I had been wanting to do something with these delightful wool beads, and I finally had the idea to cut them in half and use them in a quilt. The smaller blue and yellow bits are pom poms cut from ball fringe. 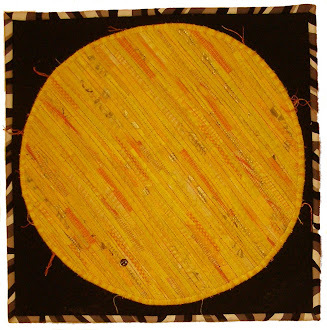 Transit of Venus, 12" x 12"
A small quilt for me, a giant spectacle in the sky. Those are 1/4" strips of yellows and oranges making up the disc of the sun. Venus is a teeny tiny button. 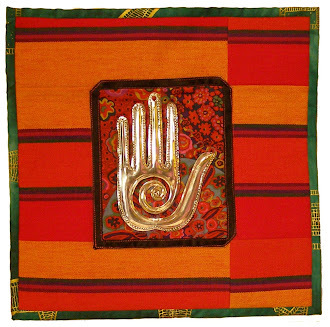 Small Quilt, 12" x 12"
The background fabric is from Mexico, as is the aluminum hand. The green and gold binding is from Africa. 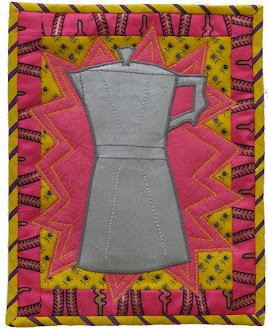 This 8" x 10" quilt was my response to Quilting Arts Magazine's challenge, "Coffee or Tea?" Failed the challenge, but I love my high-energy quilt. I'm an artist, a crafter, an arty crafter and crafty artist. The things I make are for sale. Most of them. I may be reached at da500@aol.com. 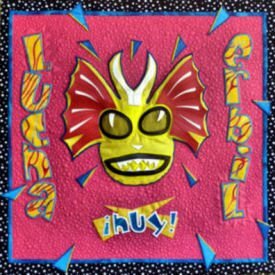 A real album, split, laminated, joined with 2" sides and bottom, laced with satin and fully lined. 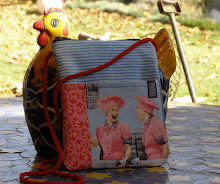 I use this as my every-day purse; it gets lots of comments and compliments! A fun way for a vintage album to see the light of day: the album was split and laminated, joined to 2" sides and bottom with pink bias tape. The straps are yellow vinyl and denim belting. It's lined and pocketed inside with a beautiful colorful floral worthy of the Dead era. 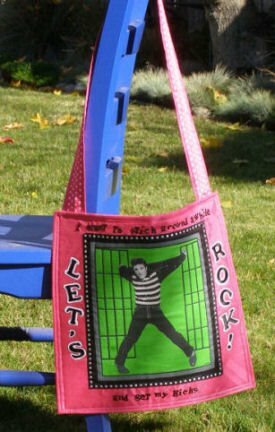 Jailhouse Rock Elvis struts his stuff on printed cotton, trimmed with silver-dotted embroidered ribbon, on a deep pink, 15" square, background. "I want to stick around awhile and get my kicks" is spelled out in black metal brads that are extra-secured with E6000 glue, and "Let's Rock!" 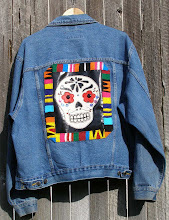 is spelled out with embroidered letters, securely stitched down. The back is an awesome same size square of black and white gingham oilcloth, trimmed with black rick-rack. A 10" yellow zipper, centered about 2 inches down from the upper edge, allows access to the lined interior, which has a large patch pocket. The 37" long shoulder strap allows the bag to hang about 18" from your shoulder. It's comfy to wear, across the chest like a messenger bag, or just from one shoulder. But it's flat! This is such an unusual design ( I found something like it in a Japanese bag-making book). And it's roomy. 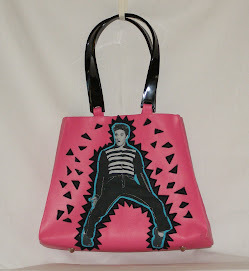 This is the bag to use when you want to be noticed. 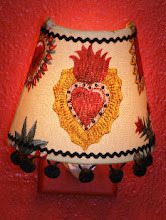 Currently available at Kali's Kastle in Orcutt, California, www.kaliskastle.com. It's a purse! There is a sock-monkey driver and a black 39" long strap. A yellow zipper follows the roof, about 11". 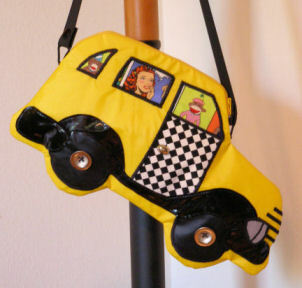 The main body of the bag is yellow back-pack nylon, with shiny and matte black pleather features. The wheels are silver colored buttons. Inside, there is a lining of delightful spring green, with two pockets, one zippered, one faced. 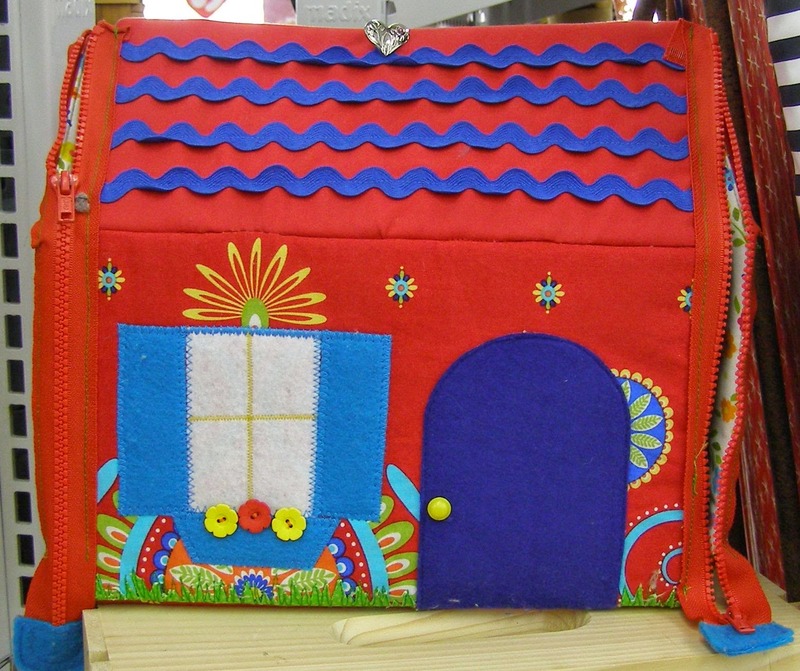 The bag measures about 9" high and about 16" long. 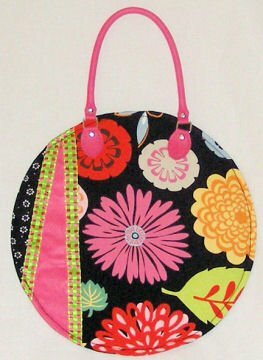 I've used a version of this bag while shopping, and it was so fun to distract my son from the candy display with a hearty, "Vroom, vroom!" 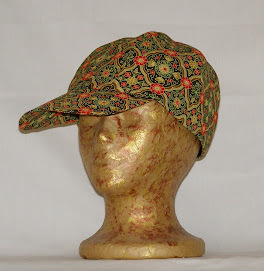 These items are no longer available, but I keep their pictures here as examples of the rockin' bobbin style. 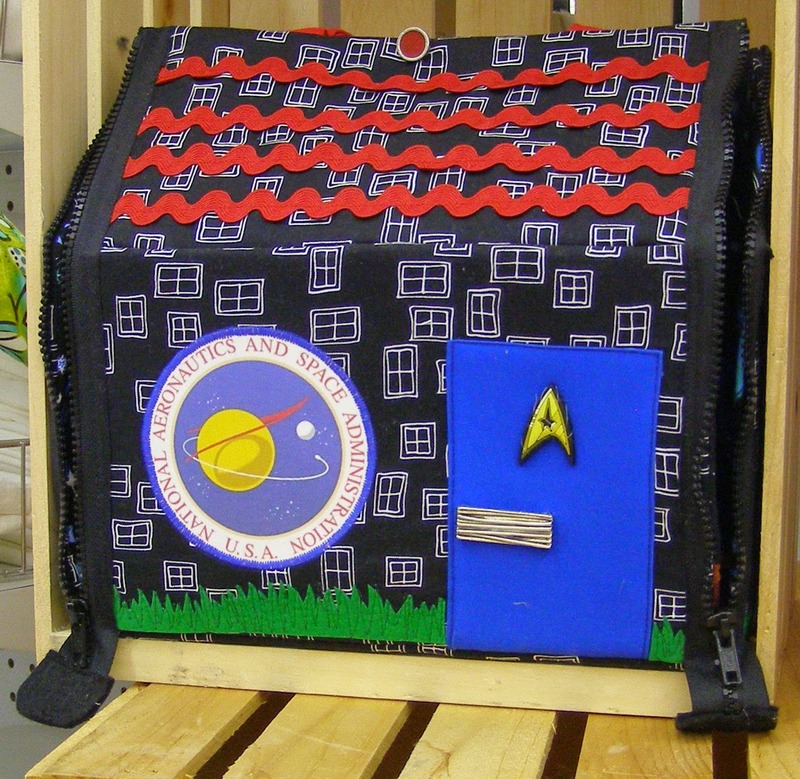 And I could, perhaps, make another homage to rick-rack or another box purse, for example, just not the same ones. All You Need 22x14" I made the lettering on this wall quilt with the "paper cloth" technique, where paper is essentially decoupaged to fabric. 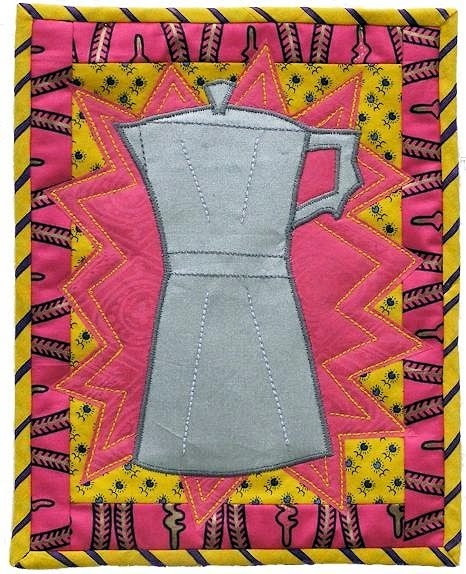 How I Feel About Coffee 8x10" Fused applique. Good use for leftover silver insulating fabric. I am an artist and a crafter. 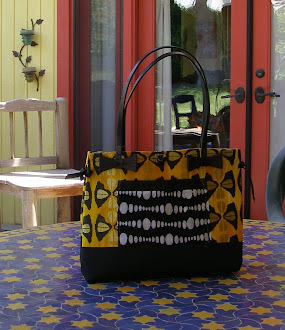 I make things one at a time, with fabrics and materials that I love. Bright colors and bold prints speak to me; rick-rack makes me smile. 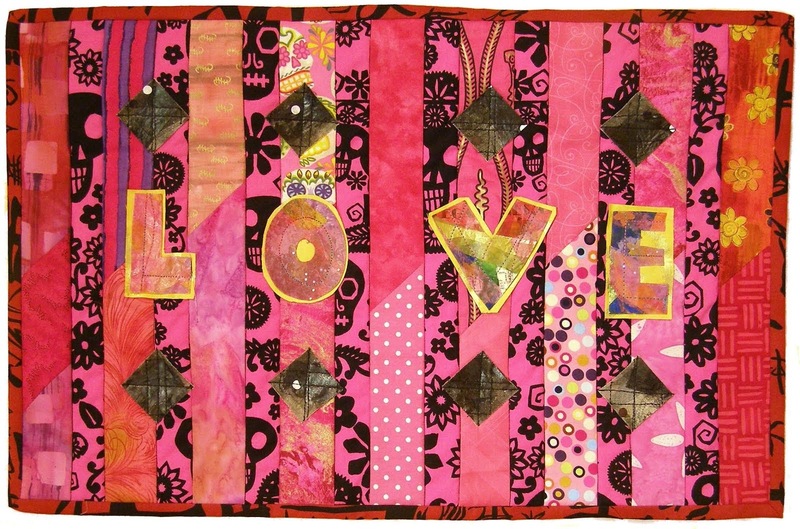 Fabrics tell me what shape they want to be sewn into; sometimes they want to be hung on a wall. It's freaky, but true. 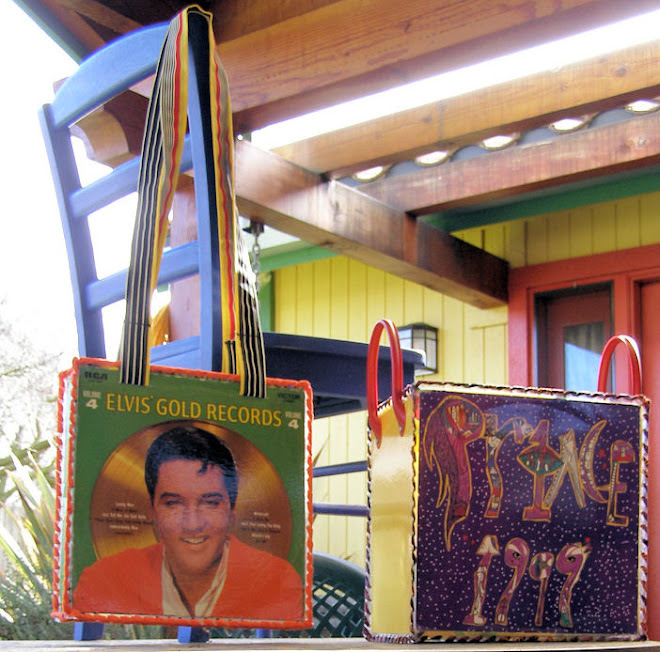 As an artist, I put love and care into the design and crafting of these things; even if an Elvis purse might not be considered "art," I hope you can see the artisic sensibility that went into the design, and the skill that went into the stitching. Everything I make is something that I would use or like to own. To contact me about the items pictured, email me at da500@aol.com. 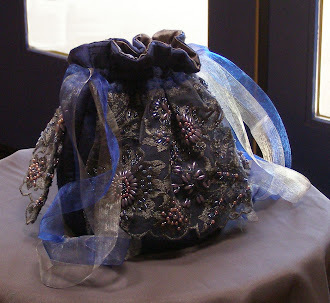 I was given Italian beaded lace with a request to make a drawstring bag. What a challenge. What an honor to be trusted with such exquisite material. 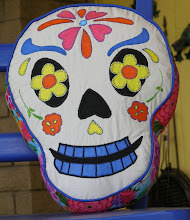 Stitched to shiny black oilcloth, this muslin sugar skull is bordered by a strap of handwoven Guatemalan fabric. Ha ha! 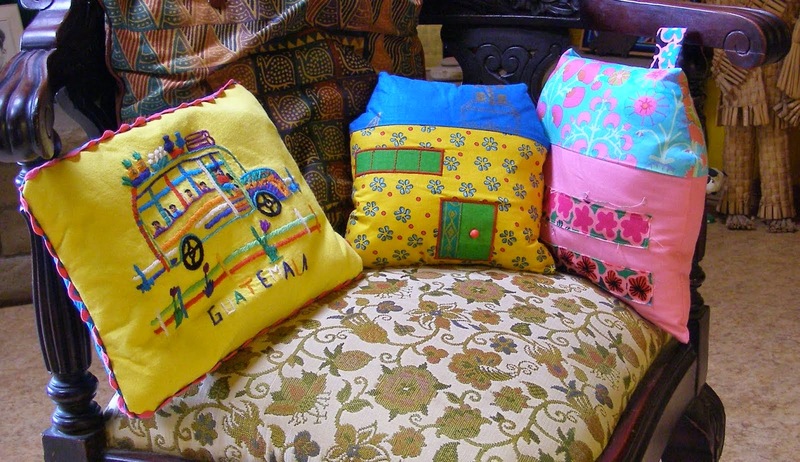 Fun and bright and a little bit startling...all cotton, machine stitched, 3 inches thick. 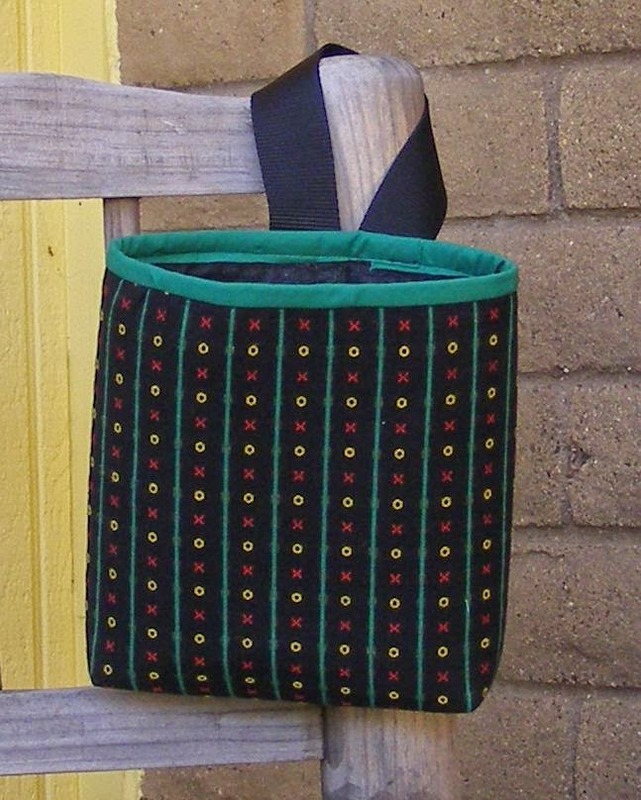 I love the "BowTucks" pattern made by Penny Sturges. I have received many compliments on this bag, and I use it daily. The leather straps are from Cindy's Button Company. 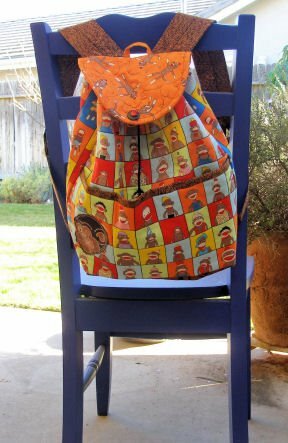 From Bethany Reynolds' Quilter's Rucksack pattern, this bag is a terrific showcase for the sockmonkey print. The big monkey face in the bottom corner is from a coin purse I took apart for just this purpose. 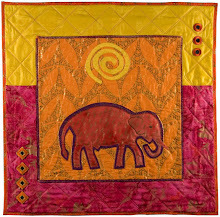 Here's a pink and gold elephant, outlined with purple, appliqued on mango and gold, under a yellow sun...gotta love color. Flat, fabulous and functional! It's 13" in diameter, with a pink faux-leather handle that's 6" high. The back is black, with a pink zipper opening across the upper third. The interior is about 8"deep, and has a patch pocket. Sugar skulls scattered all happy on aqua with red piping. Rick-rack and ball fringe do go together. 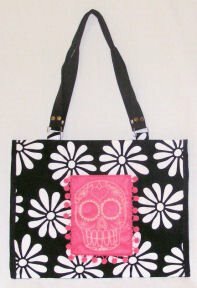 The 7 1/2" deep pink pocket sports an iron-on image of a sugar skull from CraftyChica and is trimmed with ball-fringe. At 17 by 13", the tote is sized for carrying papers, maps, files, etc., with a roomy zippered pocket inside the wow-yellow lining. An oldie! 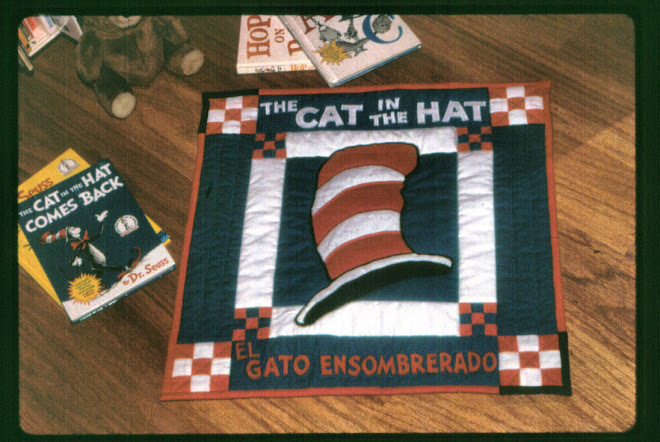 I made this (in the mid 90's) for the Nipomo library. They requested mats that illustrated children's books. 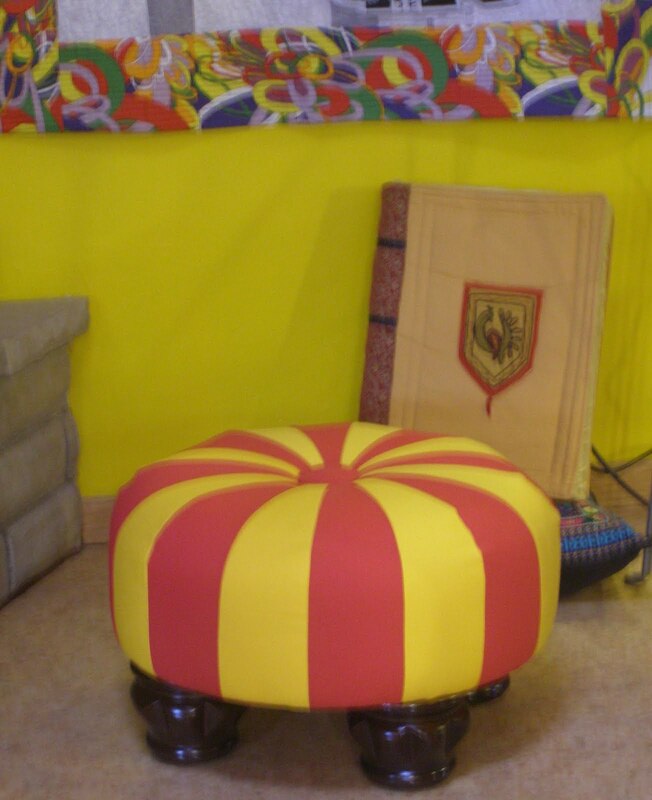 Kids would use these to sit upon during reading time. These are my first forays into this amazing hybrid of paper and cloth. And glue.